The system pictured above has an Edimax WiFi dongle so that I can control and monitor the whole thing when it’s in the kitchen. I have had quite a lot of success using a deep fat frier (square, stainless type) as a sous vide. 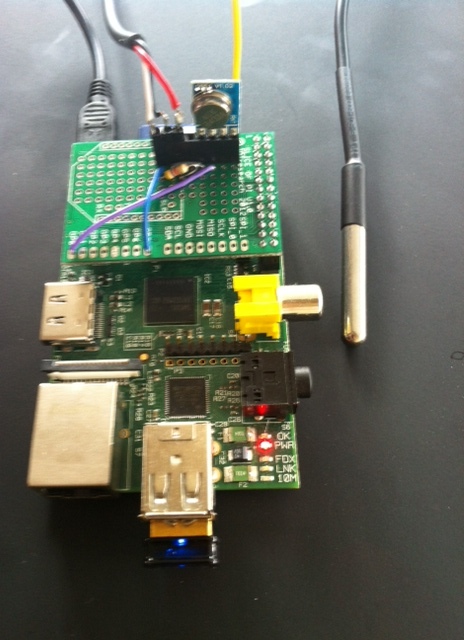 I use the same temp probe as yourself, and use the Raspi to monitor the temp and turn off/on the frier as needed. I guess anything that can hold liquid and heat it up makes a good base. How are you getting on with accuracy of temperature control (overshoot and oscillation prevention)? I’m looking forward to seeing the write up (and any code). What happens if the script crashes while heating? Is there any provision made for switching off the heater if the script is not running? I’ve not done anything about fault conditions like that (and to be honest I’m more worried about power failure taking the whole thing down versus the script mysteriously crashing). The worst case here is that the heater gets stuck on, which will likely ruin the food, but is the normal mode of operation for the slow cooker – so not actually dangerous. I do normally run a separate script to log the temperature every 15s, so I can see from that if something has gone awry. I also use those logs to graph the temperature against time afterwards. Thanks for the response Chris. I guess your slow cooker has built in sensors which will cut the power without boiling dry. I am not using a slow cooker and have built a water bath with kettle elements which could have the potential to boil dry… In this kind of failure scenario I don’t care that much about the food being ruined obviously! My slow cooker isn’t that fancy, but the heating element is pretty weedy compared to the specific heat capacity, so it’s designed to go for hours without the prospect of boiling dry. A kettle element is going to be around 10-12x more powerful so unless you’re using LOTS more water you’ll need shorter pulses of on time and I agree that runaway control becomes a greater concern – I’d be tempted to put in some sort of thermal circuit breaker. Yeah I’m on the case already, it’s a 40L water bath with 2 kettle elements. I’d rather not have a script being responsible for maintaining safety so I am going to wire in a float switch too. Hi Chris, how do I increase the cycle rate inside the control loop? This makes the loop go around 100 times. This makes each iteration take one second. 1. How quickly does the temperature rise when the heater is on? 2. How quickly does the temperature fall when the heater is off? 3. How much delay is there between a state change (heater on/off) and an observable change in temperature? I must confess that I haven’t been very scientific about this stuff myself (even though I now have the data at hand from a number of runs). The other concept that I’ve seen used elsewhere (but yet to incorporate into my own code) is the use of bias. I’ve been logging the average on/off when in use, which comes out pretty consistently at 22%. This tells me that I can maintain a given temperature by having a 22% duty cycle (22s on : 78s off), so I should probably make 22% the natural level and make the control loop go a little up or down from that. It’s also worth remembering that almost every control system is a natural oscilator waiting to be set off. It really scares me that we have people writing algorithmic trading systems that manipulate the world’s markets when there isn’t a known good way of accurately controlling the temperature of a crock pot. If you haven’t already read the discussion on tuning control loops in the Sous Vader post then it’s well worth a look. It’s also a good illustration of the point that loop frequency doesn’t help much with the fundamental dynamics. As Craig directly controls a triac his loop frequency is effectively 60Hz versus mine which is 0.01Hz, but in both cases the oscillation frequency of the overall system is much lower. The crucial point here is that changing things faster (even 6000 times faster) doesn’t help much when there’s massive latency between making the change and observing the change. Great post, thanks for this. I have a question – How is the 4k7 pull up resistor connected and used (I’m a total n00b in this…)? Thanks. The 4k7 pull up resistor goes between Vcc (red wire) and Data (white wire). You can see it (somewhat bent over) in the photo. Got everything connected on a breadboard, both the RF transmitter (to Maplin remote socket) and the temperature probe are working! Now I just need to hook it up to a slow cooker and tune the PID controls. Thanks a lot for your awesome guide!! Hi Chris, I’m awaiting my sensor and SSR, then I will be building a very similar unit to your, but using an SSR, which strikes me as simpler. FWIW, I also plan on tweaking your code a bit, eliminating the os.system calls as so much is now available natively in Python. (Examples for the curious available here: http://elinux.org/RPi_Low-level_peripherals ). A quick note: when I git-cloned your repository I picked up OpenElec, no problem, but also a 328MB file under .git/objects/pack. It caused my poor little Pi to choke a few times, but got it all in the end. Thanks very much for this, it was almost exactly what I was looking for. Sorry about that. I’m still something of a github noob, and didn’t realise until it was too late that there’s no such thing as subprojects. I fear that the .git/objects/pack is some residue from the ancient OpenELEC binaries (but as I can’t see them in github I’m at a loss in terms of figuring out what to do about it). I’ve created a new project RPi_sousvide – feel free to fork to do your SSR stuff, and any pull requests for better Python will be gratefully received. I have built a system incorporating your PI code (thanks) but as I am using a deep fat fryer with water and think 100s may be too much, if I change that to something smaller do I need to change the code “power = ((P * error) + ((I * interror)/100))/100” to divide by the same amount or maybe I could just change the sleep in the iteration to half a second or some other fraction? You’re going to have a lot of tuning to do as the thermal performance of a deep fat fryer will be very different. I expect that a shorter wavelength on the control loop will be a good idea, and I’d be tempted to drop down to 10s, so just move the decimal in a few places. Thanks. I also had to change the last 100 in the formula to 1000 otherwise the power was always 210 ish when I guess it should be more like 21.